In 1927, General Electric introduced this "Monitor Top" refrigerator, so-named by the public because of the resemblance of the exposed compressor on top of its cabinet to the cylindrical turret of the Civil War gunship, the Monitor. The product, priced at $525, was designed by Chief Engineer Christian Steenstrup (1873-1955). It had a single door, and was the first all-steel refrigerator cabinet, earlier versions having been of wood to imitate furniture cabinetry. It quickly became one of GE's most successful products and made GE the industry leader, in spite of the fact that it was perched on the top of rather traditional looking "furniture" legs. Household refrigerators had been on the market for some time. GE was the first, marketing in 1911 a wooden model invented in France by a French monk, Abbé Marcel Audiffren. Called the Audiffren, it sold for $1000, twice the cost of a car, and was produced in France. The first successful domestic refrigerator to enter full scale production in the US was the Kelvinator, in 1918. Made of wood, it looked pretty much like a small bedroom night stand, with a single door. Frigidaire, purchased by General Motors in 1919, introduced its first home refrigerator in 1921, when there were only about 5000 refrigerators in the US. Also in wood, it was larger, about the size of a bedroom armoire, or wardrobe, with three doors. By 1923, there were 56 companies making refrigerators, using sulfur dioxide, methyl chloride, or ammonia gases, all of which were dangerously toxic. Two years after the "Monitor-Top", in 1929, the Kelvinator Four refrigerator debuted with no visible "legs". Its cabinet and compressor were cleanly encased in a simple white metal box design reaching the floor. It set the design typeform for home refrigerators for the rest of the century. Freon was discovered in 1930 by Delco chemist Thomas Midgely. Non-toxic, Freon was adopted by all manufacturers, and refrigerators became safe for use in the home. General Electric, noticing the success of the Kelvinator Four, engaged Henry Dreyfuss to re-design its Monitor-Top, who designed a flat top version, placing the compressor beneath the cabinet to achieve the simple white box shape. The design was introduced under both the GE and Hotpoint brand names in 1933. Norman Bel Geddes designed an Electrolux refrigerator for Servel in 1934, who had introduced their first model in 1926, using a gas-heat absorption system invented in Sweden. 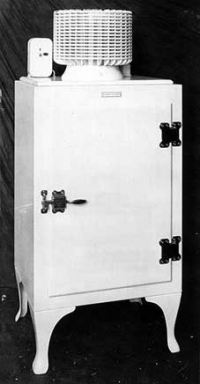 In 1935, Sears, Roebuck & Company wanted to join the fray, and asked Henry Dreyfuss to design a refrigerator for them. He was too busy, so recommended Raymond Loewy. Loewy did the Coldspot Super Six for Sears, making it a leader in the industry, and, not incidentally providing Loewy with his first major career boost. Cool, huh?